This file will teach you how to set up and use our theme. This file is really extensive so you might think the theme is hard to use, actually its not, you probably just might jump in the code and explore everything yourself, this file is more of a reference work if you do not know what to do. Have fun using our template! To visit the main theme options, either click on Theme Options in the admin bar (bellow the address bar) or go to Appearance → Theme Options. Our template is design with customisation in mind! That means you can create a very unique website, with just setting our theme options. You can change colors separately, but you can also choose one of our predefined color schemes, to either just use as your theme scheme or as a basis from which you can set colors as you wish. System Fonts: here you can find all of the basic fonts, from Times New Roman to Comic Sans. Custom Fonts: under here you will find all of the fonts you upload to the theme. See Upload Custom Fonts section for more details. Google Fonts: Our theme supports 600+ google fonts, so you have the freedom to choose whatever font you would like, but be aware that our theme uses certain font weights that may not work good with certain font families. Note that Google keeps adding new fonts, so see Update Google Fonts section for more information. Theme supports custom font sizes. It is possible to define custom font-size for Body, Menu, Content headings and for the main Page heading. Here you can choose from predefined colors schemes. When you choose a color scheme, it will only fill in the options below, so you can still change any color, without editing the predefined colors. You can put in the HEX values for what color you would like, or you can click on the colored box, which will open our colorpicker. There are 6 different button types, each of them is customizable. Buttons will refresh after Saving changes. At the initial theme installation no fonts will be added so you will need to import them by pressing Update Google Fonts in this section. Note that the process might take a while, as there are quite a lot of font families that need to be imported. If in the future you will see a new Google Font and would like to use it on your site, then import the fonts again by pressing Update Google fonts. This section allows you to add new font families. The fonts can be easily added by selecting a .zip file (you need to provide more than just one font file type, so that all browser will be able to use you font) and pressing Save all changes. This section is intended for front end developpers. Custom CSS section enables you to customize your site beyond theme options. Learning CSS is easy as it is not an advanced programming language. Most of style customization can be achieved with CSS. Using tools like Firebug or browser native developper tools will help you to search for the CSS rulsets, which you can change to your liking and paste the CSS code to the custom css section of theme options. For learning CSS there are many resources on the web. You can start here: w3schools. Here you will find all of the theme layout settings, such as is the theme boxed, is responsive activated, etc. Enabling this option, will hide the slider on mobile devices. The default value for the page layout is Full layout, but you can also select the boxed version. Once you will select the boxed version you will be able to choose 9 patterns or a custom background, which you can set to either a stretched or tilled image (tilled is best used for adding your own patterns) or you can pick a solid color. This options will hide the bar that is just below the menu, where the page title and breadcrumb is displayed. Check this option if you want to display the bar that is just below the menu, but only hide the breadcrumbs. When this page is selected, all the users visiting to your site will be shown this page. Select a page from a drop down of already added pages, which will be displayed on 404 errors. Display shopping cart icon in header? This option takes affect only if you use Woocommerce on your site. It defines behaviour of the cart icon, displayed in the header. You can display the cart icon only on the shop pages, everywhere or not display it at all. Can be set to either Style 1 or Style 2 and will change the single portfolio page styling. This content will be shown below the portfolio content on all single portfolio pages. There are 4 different front page headers you can choose from. If you choose the third or the fourth option, a textarea will apear below, where you can enter the shortcode for the slider. This slider (or any other shortcode you enter inside the textarea) will be loaded before the header of the page. This gives you a lot of new options for building the front-page layout. Can be set to either default (the top menu will be shown if it contains widgets), primary color (the top menu will be shown if it contains widgets, but will have a background color set to primary) and no (this will hide the top menu). Can be set to either normal or description. If set to description it will display the description text below the top level links. If checked, the main navigation will be centered. If this options is set, the menu will be always shown on the top of the page, even on scrolling. This option will take effect only if sticky menu is checked. Please make sure to upload both versions of the logos in "LOGOS & MEDIA". This option enables different transitions between standard logo and sticky logo. Transitions are just different visual effects, when standard logo changes to sticky logo. When you cahnge an option, you can observe changes (on the front-end) by scrolling with yor mouse up and down. Display search icon in menu? This option will toggle on/off the search functionality in main navigation. If checked, a search icon will be displayed in the main navigation area. Display search on mobile and tablets? If checked, search will not apear on tablets and mobile devices. If checked, the prefooter widgets areas will become available. You can than choose how many columns will be displayed with setting "Prefooter style" option. You can select three prefooter styles: 2 columns, 3 columns or 4 columns. Once you select a prefooter style the appropriate widget areas will appear under Appearance - Widgets. Check this, if you don't want the footer to be displayed. You can select three footer styles: 2 columns, 3 columns or 4 columns. Once you select a footer style the appropriate widget areas will appear under Appearance - Widgets. Determines the copyright footer widget areas. Can be set to either 1 columns (which is centered aligned) or 2 columns. Here you can set your email address that is used for the contact form and Google Analytics account. Background for the page heading element, that is located just below the main menu. Background for the search page heading element, that is located just below the menu. The selected image will be used as your site logo, which will be shown at the top left of your site. Here you can specify if you want your logo to be automatically adjusted or you can manually adjust the logo width and height. This will change the logo with and height. If you use a sticky menu on your site, you can upload a smaller version of your logo for sticky menu here. You can upload an image - icon, that will be shown at the top of browsers for your site. You can upload .png and .ico files. Here you cant find the Captcha options for the contact form. You only need to set this options when using a Captcha element in your form. Importing demo content with one click dummy content import is the fastest way to get you started with your new theme. After importing the demo, you just change images and text. You can also learn how to setup the pages from these examples. Important: Please make sure you have set your links to pretty link, so you won't receive any errors, check also menu description below. Important: If you are having trouble inserting dummy content and are receiving server errors, you will probably need to set your file permissions on folder wp-content/uploads ( if you don't have the folder, create it manually and set the permissions only on this folder ). If you don't want to set, can't or don't know how to set file permissions, you can download this .zip file and place it into wp-content folder. In our theme files you will find a .xml file (under anps-framework/classes/importer/dummy.xml). Use that file in the next step where it says: "Choose a WXR (.xml) file to upload, then click Upload file and import." and click on Upload file and import. In the next step you need to assign all the posts/page to a existing user or create a new user. In this step also be sure to have the Download and import file attachments checked, then click on the Submit button and you are done! We tend to release upgrades to our themes quite a lot. Upgrades usually bring new features and bugfixes. By creating an API key on themeforest you can automate the upgrade procedure. If you are customizing the theme and you are changing the theme files, we suggest creating a child theme. Using child themes for customization enables safe upgrading of your theme in the future, without loosing any of custom changes. To create a megamenu you will first need to go to Appearance → Menus and open the Screen Options and checking the CSS Classes and Description options (you can also check the Product Categories if you intend to use them). Click on Save Menu to save the settings. Then you need to assign a megamenu class to the parent element - the element at the top most of the structure (in the below examples this means to the Shop element). To add a group of links, you need to first add a parent element that will contain the title. When adding the parent element set the URL to "#", the Navigation Label to the desired title (in our example we named it Links) and assign a column layout class (.col-md-4 for example) class to it, so it changes it to a heading. Create a new element and set the URL to "#", the Navigation Label to the desired title (in our example we named it Links), assign a no-link class to it, so it changes it to a heading and insert you text in the description area. You can use the [image url="#" target="_blank" alt="Alternative text"]Image URL[/image] shortcode inside the description area to add images. 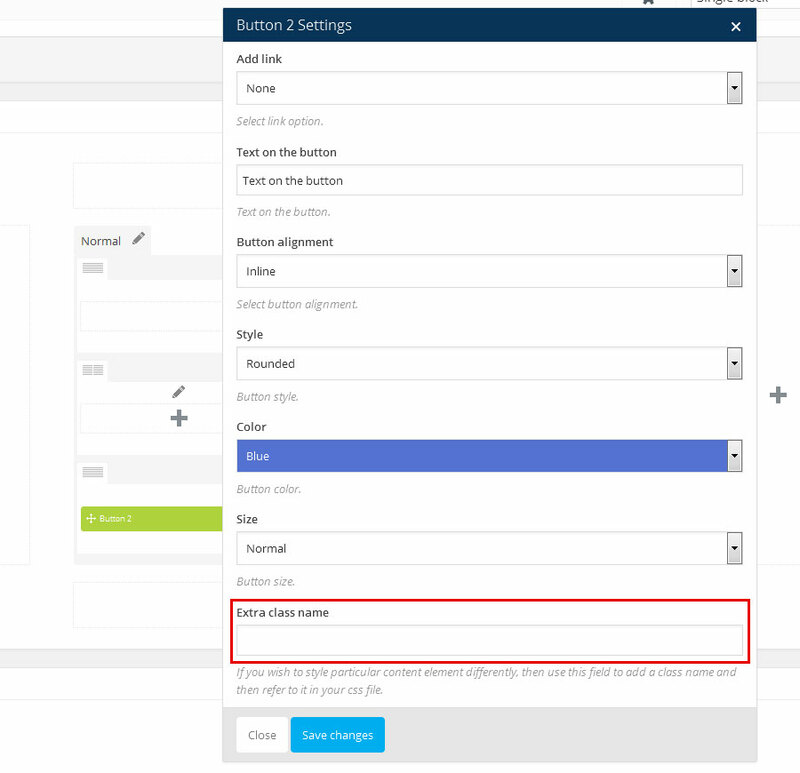 If you do not want to use our Shortcode Manager, then you can install Visual Composer, which allows you to add content using a visual editor - you do not need to write the shortcodes by hand. If you need more information on our shortcodes, then check our shortcode section. To add a post to your blog go to Posts → Add New, then add post heading, post content, add Featured image and assign the desired categories. See more details on adding posts. Above the Featured image option (right side) on posts you can find the Featured Video option. You can add either the [youtube] or [vimeo] shortcodes to display the videos. Above the Featured image option (right side) on posts you can find the Gallery Images option. Adding Portfolio posts is the same as adding Blog posts, the only difference is that you do not add the posts under Posts, but under Porfolio sections. There are two styles, that you can choose from in theme options. Style-1 shows multiple images normally, while style-2 shows them in carousel slider. Another difference is the layout. Style-1 display portfolio details on the side, style-2 displays them below the carousel. If you choose to use portfolio style-2, make sure all the images are at least 1200px wide. Carousel looks best when height of the images is equal for each portfolio. You can add widget in Appearance → Widgets by drag and dropping in the Sidebar box. Once you have added a widget to the Sidebar box the widget will open and extra fields will appear. You can add downloadable file. First title is widget title, than you can add file title and select file from dropdown list (all files from media library) or enter url to file (file external input field). You can also select icon from font awesome and color for icon and backgroud color, you can leave it empty and widget will take these colors from theme options. You can select any image from media library and shows it in any sidebar. You can add up to 12 social icons into different sidebars. If you will select Sidebar content checkbox, icons will be bigger like in blog sidebar. content * / Text that will be shown in the alert message. type normal Changes the alert message color and icon. content * / Number of posts to be displayed at once. columns 3 The number of posts in a row. Can be set to either 3 or 4.
orderby The way the posts will be ordered. Can be set to date, ID, title, name or author. order default The order in which the posts will be displayed. Can be set to default, ASC or DESC. category / Slug of a specific category. type The styling of blog posts. Can be set to grid or masonry. target _self This attribute specifies where to display the linked resource. Can be set to _self, _blank, _parent or _top (read more about these values). size small Determines the button size. Can be set to either small, medium of large. style_button style-1 This changes the button styling. Can be set to either style-1, style-2 or style-3. color / Adding this attribute will change the text color. The color needs to be added as a HEX value (ie. #000). color_hover / Adding this attribute will change the text color when hovering over the element. The color needs to be added as a HEX value (ie. #000). background / Adding this attribute will change the background color. The color needs to be added as a HEX value (ie. #000). background_hover / Adding this attribute will change the background color when hovering over the element. The color needs to be added as a HEX value (ie. #000). icon / Adds a icon inside the button. Can be set to any FontAwesome icon. The icon name needs to be specified without the fa- prefix (ie. codepen and not fa-codepen). content * / Text that will have the specified color. style style-1 Color style. Can be set to either style-1 or style-2. custom / Custom specified color. Can be set to any color and will overwrite the style attribute. The color needs to be added as a HEX value (ie. #000). width / Enter the layout , like: 1/2 + 1/2 or 1/3 + 1/3 + 1/3, etc. content * / You can add newsletter shortcode or any other content here. image / Background image url. title / Coming soon title (h1). subtitle / Coming soon subtitle (h2). date / Date example: 2015/10/20 19:00 (20th October 2015 at 19:00). Our theme uses very popular Contact form 7 plugin. With this plugin you can create customized forms and add it to your pages and posts with a shortcode. Official documentation for Contact Form 7 is available on wordpress.org. min / The number from which the counter will count from. max / The number to which the counter will count to. content * / Text that will have the dropcaps letter. style style-1 Dropcaps style. Can be set to either style-1 or style-2. title / Error 404 page title (h1). sub_title / Error 404 page subtitle (h2). answer_title / Faq answer title. Once you receive your API Key, inside the WordPress admin dashboard navigate to Appearance - Theme Options - Google Maps and input your API key in the input field. zoom 15 At low zoom levels, a small set of map tiles covers a wide area; at higher zoom levels, the tiles are of higher resolution and cover a smaller area. content * / Location to be shown with a pin, ie. "121 Kings St Melbourne VIC 3000". info / You can add info which will be shown on hover over pin on google maps. pin / If you want to use another pin on google maps, than you can upload or select it in visual composer. If you are not using visual composer, you need to enter id of image. type heading Heading type. Can be set to heading, content_heading or style-3. size 1 Heading size. Can contain values from 1 to 5 (larger the value, smaller the heading size). h_class / If you wish to style particular content element differently, then use this field to add a class name and then refer to it in your css file. h_id / Adds an ID attribute to the element. Useful for one page menu referencing. url / Icon, title and subtitle will be clickable. target _self Default value is _self. title / Icon title (h2). subtitle / Icon subtitle (h3). class style-1 Style-1 is for bigger icons. Style-2 is for smaller icons where icon could align left or right. position icon-left Position icon-left is default (demo example). You can also use align right (icon-right). content * / [list_item] shortcode goes here. class / You can add class="number"
content * / List item text. alt / Alt of logo image. img_hover / Logo image on hover. alt_hover / Alt of logo image on hover. You can include newsletter plugin as a shortcode instead of widget. per_page / Number of posts to be displayed at once. filter on Filter on/off. Shows category filter. columns 4 The number of posts in a row. Can be set to either 3 or 4.
orderby / The way the posts will be ordered. Can be set to date, ID, title, name or author. category / Id of a specific category. type / The styling of blog posts. Can be set to classic, random or empty (it is for no padding). title / Pricing table title. Period / Time period, example: monthly. button_text / Enter button text. button_url / Enter button url. Content * / Title of progress bar. procent 0 Procent number 0 to 100.
striped true Progress bar will be striped. active true Progress bar will be animated. color_class progress-bar-success There are next color class options: progress-bar-success (default), progress-bar-info, progress-bar-warning, progress-bar-danger. number 4 The number of posts to be displayed. category / The category from which the posts will be displayed. This shortcode is used for wrapping content, so that the child elements are layout correctly. font_color / Adding this attribute will change the text color. The color needs to be added as a HEX value (ie. #000). el_class / If you wish to style particular content element differently, then use this field to add a class name and then refer to it in your css file. id / Adds an ID attribute to the element. Useful for one page menu referencing. has_content true Changes where the .container element is called. Can contain either true (the container is added), false (no container is added) or inside (inside content wrapper). url # Url of social network. target _blank Url target, default is _blank. parallax false If set to "true", the shortcode will get the parallax effect. container false Adds div around statement. type horizontal This attribute changes the tabs layout to either horizontal or vertical. title / Tab title that is shown in the tab menu section. category / Enter team category id. ids / Enter team item id/s separate with ,. For example ids="1,5,81". columns 3 The number of team members in a row. number_items -1 Enter number of team members (-1 will display all members). slug / This is used for both for none page navigation and the parallax effect (if you do not have the navigation need you enter a unique slug if you want parallax effect to function). title / Enter twitter element title. parallax false If set to true, the background image will have the parallax effect (http://en.wikipedia.org/wiki/Parallax_scrolling). parallax_overlay false If set to true, it makes the background image darker. image / URL for the background image. content * / Text that will displayed inside the quote wrapper. style style-1 Quote style. Can be set to either style-1 or style-2. Before you can start adding widgets you need to create a new sidebar, but you can add widgets to the already added ones, but you can create how many new sidebars you like. You can find the sidebar generator under Appearance → Sidebars. You can add a sidebar to all pages, except the portfolio page and single item portfolio page. You can add a sidebar to a page/post by selecting the desired by going to the desired item in WordPress (under Pages/Posts) and under the content editor you will see a box called Sidebars. You can select eiter only one of the sidebars, either both of them. Important: Be carefull when adding two sidebars, because some elements aren't designed to be used with two sidebars ( two or more column sidebars ). Our theme comes localisation ready out of the box – all that’s needed is your translation. There are several methods to create a translation, most of which are outlined in the codex (http://codex.wordpress.org/Translating_WordPress), however, we find the easiest method is to use a plugin called codestyling localisation. Go to our ThemeForest item page and see all of the changes in the change log. Here you will also find if there are any problems if you update / what you have to do. Save all of your changes files, ie. the custom.css file (you don't need to worry if you are using a child theme). To update our theme, go to ThemeForest and download the newest version of our theme (you can check all of your purchased items under the Downloads tab). Unzip the .zip files until you get the themes (Accounting) folder, then go to your server and place the files under wp-content/themes/. Please note: our theme cannot be updated via WordPress, so if you are promted to update the theme, please do not click on the update, as you may lose your files. A WordPress child theme is a theme that inherits the functionality of another theme, called the parent theme, and allows you to modify, or add to, the functionality of that parent theme. The whole idea of a child theme is that you can modify, and add to the functionality of that parent theme without modifying it directly. The parent remains intact, everything is built within the child theme. Easy updates - If you’re using a child theme, you don’t have to worry about any updates. Whenever you update the theme, only the parent theme will be updated. Your child theme, and everything you’ve coded in it, remains intact. You can set up the footer in the same part as Widgets, Appearance → Widgets. The only difference is you don't drag and drop in the sidebar boxes, but you add them in Footer Widget Areas. In each column you can add what you like, as the widgets look different in the footer than in the sidebars. This theme has been built using Twitter Bootstrap. We did not use every aspect of it, but only include parts of it. For example, we have removed the default Glyphicons font icons and include Font Awesome instead. If you want to use a feature of Bootstrap that we did not include, then go to assets/sass/bootstrap.scss and uncomment the import functions. Many elements used in this theme are almost identical to Bootstrap components, so you check their documentation if you need extra help or check if they have extra functionality that is outside the scope of our theme.